Three-time champ Dan Henry was denied again this year. In all, six former champs with 11 shields were present in what is widely regarded as among WBC's most competitive tournaments. Ray Freeman and defending champ Ed Menzel face off in one of seven rounds. With players of this caliber among the also rans you know you've been in a tournament. 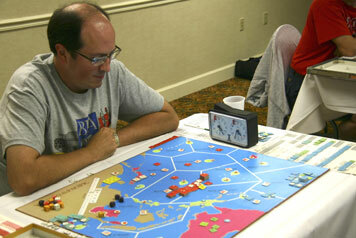 95 games of tense Pacific WWII action! Suspense right down through Round 7! 39 players vying for the Top Honors in the 17th Victory in the Pacific Championship Tournament! Congratulations to Darren Kilfara (6-1), of Great Britain. After seven rounds ending in a 61 Tournament-Point tie with Andy Gardner (6-1), Darren won the tie-breaker on Strength of Schedule to take the Wood home with him across the Atlantic. The Nagumo Award, for Best Japanese play, goes to Andy Gardner and Mike Kaye, each with five Japanese wins. The Halsey Award, for Best Allied Play, is shared by Darren Kilfara, Dan Henry, Bob Hamel and Joe Powell, all with three Allied wins. Basic stats: 95 games played, and one bye. 60 IJN wins ; 63.2%. 31 Allied wins; 32.6%. 4 ties - 4.2%. Average bid for IJN in games featuring a non-zero bid: 3.86 POC. Average bid for IJN including all 95 games: 3.54 POC. There were eight games played with no bid. One game utilizing NT1 featured a 1.0 POC bid for the Allies! Round 1 began with 24 players - 12 games, increasing to 13 games for Round 2. New players brought Round 3 to 15 matches, and Round 4 featured 16. 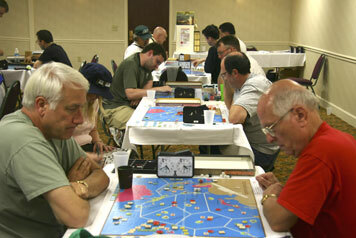 Round 5 had 14 games, Round 6 had 13, and the final Round 7 completed the Swiss-style tournament with 12 tense games. Format changes this year included first round matching based on arranging players by AREA ranking and matching top-half to bottom-half. With 24 players, #1 played #13, #2 played #14, #3 played #15, and so on. The second change was to bring strength of schedule into the tie-breakers. In fact, the tournament ended in a 61-tournament-point tie between Darren Kilfara and Andy Gardner, which Darren won based on his slightly-tougher opponents' records. Mike Kaye took fourth from John Pack on a tie-breaker, also, since both Mike and John finished at 5-2. Games finishing in a tie played a prominent part this year, as Dan Henry's tie against Charlie Drozd gave him tournament points to overcome the two 52 point 5-2 players for third, and then allowed John Sharp (ViP GM) (4 wins, 2 losses, 1 tie) to sneak into sixth place in front of three players tied for seventh with 4-3 records. Best Improved Player, new for 2007, goes to Mark Booth. Mark's record this year of 4-3 earned him 9th place in this "SeaofSharks."